Moisture control of the bunker sand is more than just drainage. Moisture control is the ability to rapidly drain rain events and to be able to keep moisture in the bunker sand in dry conditions. Capillary Concrete™, a patented and engineered polymer-based concrete, is the only building material that can move water both up and down to precisely regulate the moisture content of any adjacent material, such as sand or soil. Developed in Scandinavia, Capillary Concrete can withstand even the harshest climates with severe winter ground freezing conditions. Capillary Concrete combines macropores with micropores to quickly move water down with the force of gravity for drainage, and up against the force of gravity with capillary force. The material’s polymers are what create microscopic connections in the actual binding agent of the Capillary Concrete. Capillary Concrete testing shows how moisture moves in a dry sample (left) placed in moisture, to being saturated after 3 days (middle) and the sand sticking to the vertical face (right). The sand stays on the Capillary Concrete due to the capillary connection of moisture between the liner and the sand. Watch legendary Superintendent Jacques Leonard test Capillary Concrete. Capillary breach occurs when the pore sizes of two materials do not match, and moisture will then not be able to move against gravity. 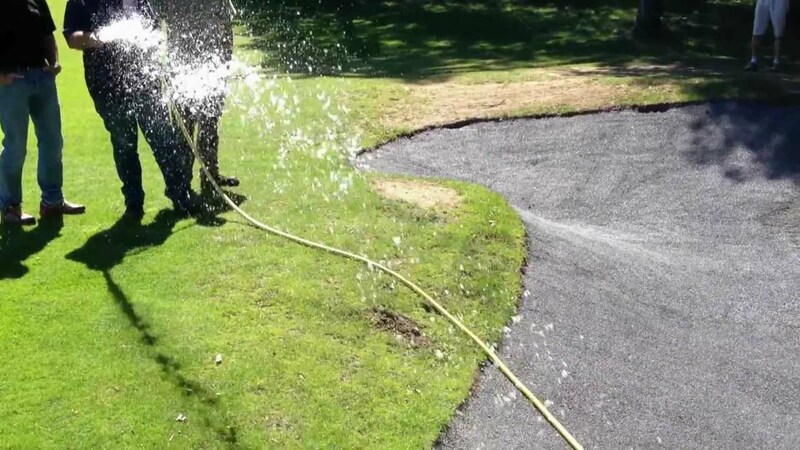 For example, capillary breach is used in a USGA green to stop irrigation from exiting into the drainage system until the profile is filled up. Water will not move from a small hole to a large hole until gravity is strong enough to pull it down. In a green, capillary breach is used to store large amounts of water in the sand for the roots. In bunkers, we want to avoid a capillary breach as it only results in sand being excessively wet in the bunker base and shifting and sliding down the face of the bunker with rain events. It also results in sand having different moisture levels on faces and in the base of the bunker, and therefore different playing conditions and higher maintenance costs. Capillary Concrete contains large pores that freely drain water by force of gravity, but are not too large in order to avoid migration of sand particles into the drainage system. Excessive moisture in the base of the bunker can be an issue with modern bunker sands.. Capillary Concrete is the most effective material to keep the sand in the base of the bunker from becoming overly wet because there is no capillary breach and water drains by both gravity and capillary action. This is more effective than a perched water table situation, which is what every other bunker liner product creates. Think of a USGA green situation where the sand is holding moisture on top of a gravel base. Capillary Concrete works like a paper towel placed under the sand instead, which will more effectively soak up excessive moisture from the sand through its capillary pores. In all circumstances it is always recommended to perform a Water Release Curve test on the bunker sand prior to a final decision and purchase to get a better idea of the sand’s moisture-holding percentage at the desired depth. If you let the bunker sand dry out, which can easily happen if the liner is not capillary connected to the soil, sand will migrate down through the drainage system even if the pore sizes bridge like in a USGA greens specification. This is because dry sand can more easily penetrate and move, and dry bunker sand that gets shifted around can get worked in to the drainage system. Moist sand stays in place and does not migrate if the pore sizes are kept within the requirements. The key is to make sure the sand stays moist at all times, to avoid capillary breach. Moisture being fed to the Capillary Concrete with the drip-line system and beginning to moisturize the steep bunker face.